There are two common designs for diesel cylinder heads: large (huge) castings for 6 cylinder inline engines with 24 valves, and single-cylinder heads, each with 4 valves (such as found on the CAT 3500). The single cylinder heads are the biggest challenge! 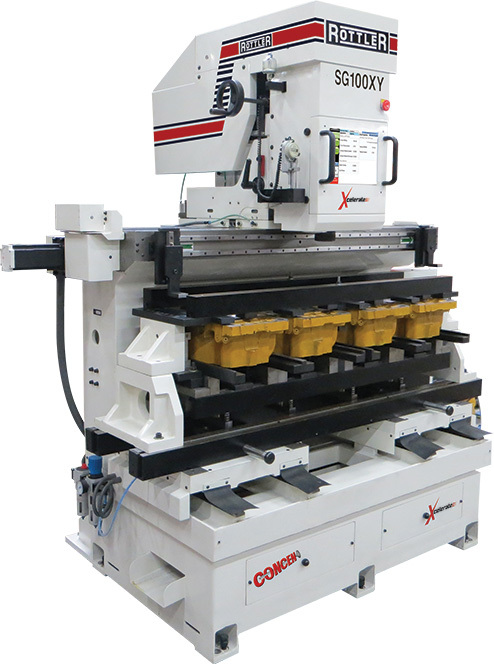 Most seat and guide machines can only handle one single head at a time, requiring the operator to load, clamp, machine intake seats, change tooling, machine exhaust seats and then unload the completed head before loading the next head. A tremendous amount of time is wasted. Operator fatigue becomes a real concern as the operator has to spend so much time just loading and unloading and not getting the critical machine work done of cutting valve seats and honing valve guides. Rottler has developed fixtures that allow easy loading of four single heads and then, with one button operation, all heads are clamped at once. The fixture is designed to accommodate different height heads as often heads being remanufactured have been worked on before and are not equal thickness and also may not be parallel. 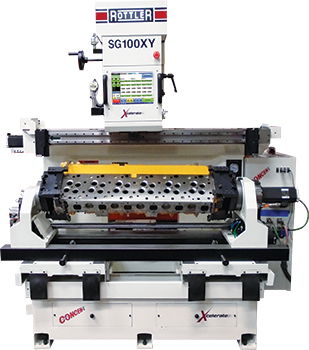 After the heads are clamped, the SG100XY is able to machine all the intake seats unattended and after a quick tool change, the software automatically changes the program to cut all the exhaust seats unattended. For the large 24 valve castings, Rottler has developed a servocontrolled 360-degree rollover fixture with power clamping. Easy and fast to set up, these huge castings can be rotated 360 degrees and leveled for many operations such as valve guide and spring seat repairs, injector tube repairs and even drilling out broken studs on the exhaust manifold surface on the side of the heads. ACTIV SPINDLE - The Centerline of all valve guides in one cylinder head are not always in perfect alignment. 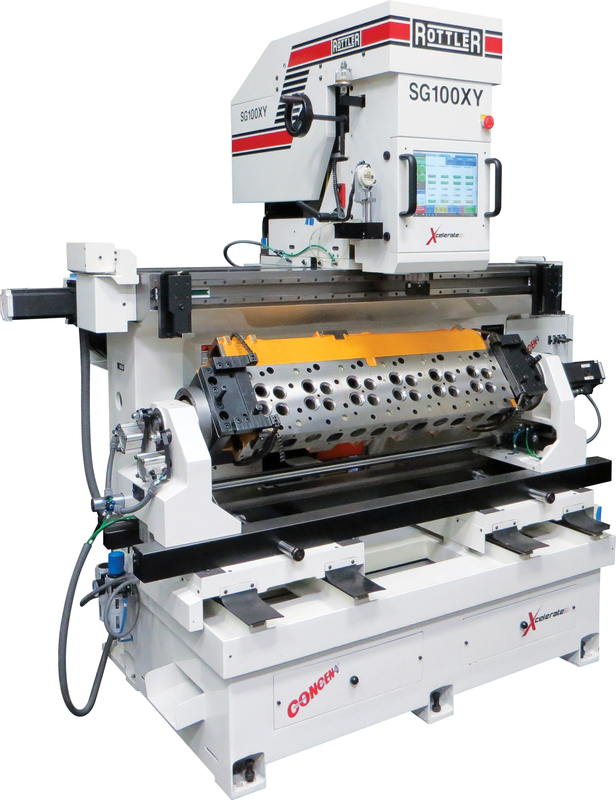 The SG100XY has the latest design ACTIV Spindle which has a sphere built inside the spindle which compensates for any misalignment and allows the UNIPILOT tooling system to automatically center with reference to the valve guide centerline while the workhead is floating on air cushions. Once the floating stops and the workhead clamps, the UNIPILOT and valve guide centerline are maintained while the valve seat is cut giving excellent CONCEN. When performing machining operations other than valve seat cutting such as valve seat housing counterboring and valve guide reaming, the spindle is required to be locked vertically. The ACTIV spindle has a pneumatic locking system that locks the spindle sphere rigidly vertically for other types of machining requirements. 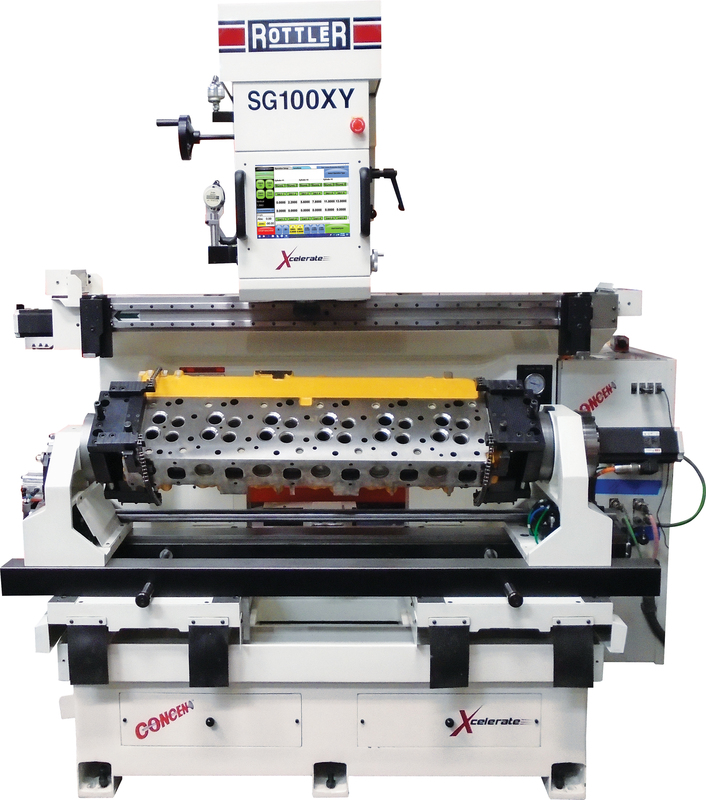 Automatic Guide-to-Guide - The SG100XY is engeineered to have a very light workhead that floats independently on a base plate allowing precise centering of the pilot in the valve guide. The base plate moves the workhead from guide-to-guide by a precision ball screw and servo motor. The complete assembly clamps with air pressure for rigid machining. Quick X Axis Alignment System (Patent Pending) - This feature is the secret to productive guide-to-guide automatic machining! After the cylinder head is clamped in the fixture, 2 pilots are installed in the outer valve guides and 2 the alignments arms are moved on linear slideways inline with the 2 pilots, at this stage, the complete fixture assembly floats on air and the 2 pilots contact the 2 alignment arms which aligns the valve guides with the X axis movement of the workhead. At this stage, the fixture clamps on the machine table, the 2 pilots are removed and the cylinder head is ready for automatic guide-to-guide machining. SSV Spindle Speed Variation - Rottler has developed special spindle motor control technology to vary the spindle speed while finish cutting the valve seat. SSV varies the spindle speed to specified speeds and controls the time of acceleration and deceleration in micro seconds giving improved surface finish for perfect CONCEN and vacuum seal. Windows Touch Screen Control - Windows based touch screen control is easy to use for automatic hole to hole operation without requiring complex CNC programming. Light Weight Workhead floats on Base Plate - The new design SG series utilizes a very light workhead that floats independently on a base plate allowing precise centering of the pilot in the valve guide. The base plate moves the workhead from guide-to-guide by a precision ball screw and servo motor. The complete assembly clamps with air pressure for rigid machining. Variable Speed Servo Spindle Drive - CNC Servo Spindle Motor Drive controls the final speed and number of revolutions then lifts automatically giving perfect surface finish results – every time! Multi Angle Seat Cutting - Rottler’s Precision CNC Ground Fine Grain Carbide Seat Cutting Inserts are available in many different designs to suit customer requirements: single angle, multi angle or curves and radius shapes are available. All valve seats in a cylinder head are exactly the same and the SG100XY cuts every seat to the same depth. Cutting Insert Sharpener - Machine Mounted diamond wheel tool sharpener for fast, easy sharpening of multi angle cutting inserts. Electronic Level and Angle Sensor - Digital Readout on the Touch Screen allows different Cylinder Heads to be leveled quickly and accurately. Special Alignment System for fast set up of wide variety of cylinder heads (Patent Pending)Internet connection to the machine computer must be provided. Internet connection to the machine computer must be provided for future support and software updates. Automatic Cycles for Seat Cutting, Housing Boring, Guide Drilling and Reaming, Thread Tapping. Programming and Machine Operation thru 15" (400mm) extra bright touch screen. SSV Spindle Speed Variation – Variable Spindle Speed during finish cut for improved surface finish. Rottler New Technology Touch Screen CNC control uses 'state of the art' Direct Motion Control Technology and Windows Operating System. The PC computer links directly to the internet for future software upgrades and servicing worldwide. Rottler technicians are able to connect direct to the machine computer. Conversational Touch Screen Control allows simple programming for many cylinder head machining operations such as Seat Cutting, Housing Boring, Guide Reaming, Drilling, Tapping, and many more functions. No experience required and easy to operate with information saved for future use. Store additional information in the SG100XY computer such as specification manuals, machining data, etc.